EPIC Blog. Empowering Youth for Peace in Iraq. This blog high-lights the humanitarian costs of conflict in Iraq. 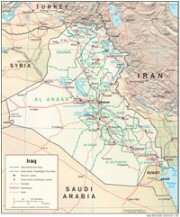 Iraq Situation Report - Institute for the Study of War. Just Security - Law Blog - Iraq tags. Musings on Iraq. Iraq News, Politics, Economics, and Society. Security Info Net. A blog providing information, links, commentary, and insight on security, terrorism, homeland security, and the war in Afghanistan and Iraq. Small Wars Journal. News and commentary about Iraq and other conflicts around the world. The Best Defense. Thomas Ricks daily take on national security. Wings Over Iraq. A US Army aviator and military blogger. Directory of Iraq Blogs and Diaries. Yahoo! Blogs of War. Information Today, Inc. (circa 2005). The Thunder Run. A milblog. Boots in Baghdad. A Grunt's Life. Letters to Baghdad. A tribute to our troops. The Sandbox. GWOT Hot Wash, Straight from the Wire. The Arabist. Blogging about the Middle East. Great Satan's Girlfriend. A blog on national security; but with great scenary. The Strategist. The Australian Strategic Policy Institute Blog. A Glimpse of Iraq. A blogger explores the Iraqi War. Baghdad Burning. (Last entry April 9, 2013). ". . . I'll meet you 'round the bend my friend, where hearts can heal and souls can mend . . ."
Reporters' Log. BBC News. Circa 2003. A Year in Iraq. 2004-2005. The Ground Truth in Iraq. EPIC Dispatches from Iraq and around the world on the crisis facing Iraqis and on the agencies and individuals making a difference. (last post Aug 10). Acute Politics. A Iraq blog by a U.S. military member. (last post April 2010).